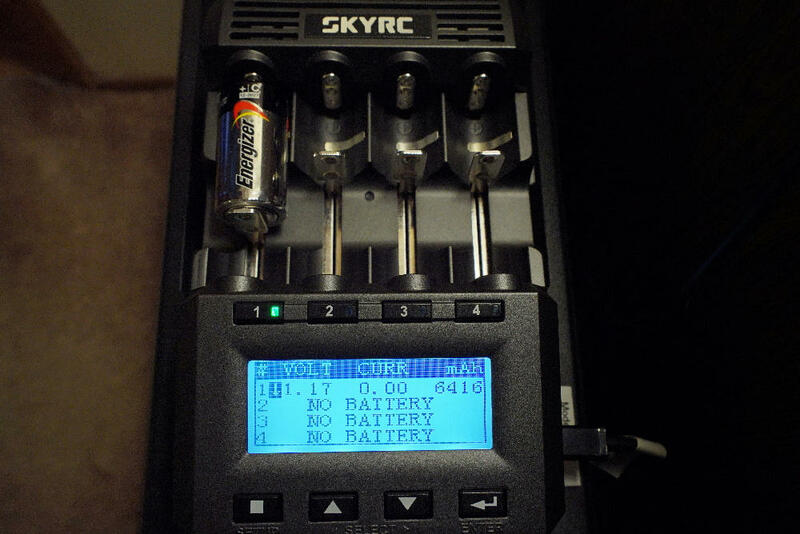 Anyone think it's a good idea to start a question and answer thread about the SkyRC MC3000 charger, how to program it and any questions related to it? I got a couple of my own questions too. Go ahead and ask. If someone can help I’m sure they will. I recently bought my third one. Unless I’m traveling it’s the only charger I ever use now. Three of them, not bad! I can see how this charger can be addictive. My first question. When using Storage Mode. Does that mean it charges or discharges the batteries to 3.8V and then the slots light up green? That’s fine, if you want to speed things up a bit you can use a higher current. A good 3400mAh 18650 can handle 1.5A charge no problem. Storage mode will charge or discharge whatever it takes to get to the voltage you have “target volt” set to. The default is 3.8V for LiIon. Storage mode works a little different than other discharge routines in that “cut volt” and “d reduce” are ignored. Storage mode will always use “target volt” and “termination” do determine when to stop even if it’s discharging. Thanks Frank, very helpful. Right now I am using Simple Mode, so knowing storage default is 3.8V, I'm good to go. Have not moved up to the advance modes yet where they have all the extra info in the menu. D-reduce, does that mean charging current will constantly reduce power as it gets closer to the batteries cut volt? Shouldn't make any difference if I am putting the batteries away for awhile hopefully. I noticed that after the batteries reach storage voltage of 3.8V and no more discharge is applied, instead of the button light turning green, it still stays red. The screen will show discharge current rate at 0.00 instead to let the user know the process has completed so thought I should mention that to anyone following this thread. D. reduce is used for discharge routines and yes it’s the current cut off after the cut volt is reached. It’s very similar to what termination does on charge routines. One of the things that I really like about the MC3000 is it will only start to lower current when target volt is reached and not before. Same with discharge it goes full current until it hits cut volt. Got it thanks. My batteries were around 3.9v so I entered the storage info in the charger just to see what it will do to them and now they are both at 3.8v and discharge current is progressively dropping from 0.5A to now 0.11A. a) How you guys measure your battery‘s capacity and internal resistance, especially with brand new cells. My question also refers to the variety of cycle modes. e.g. D-C-D or C-D-C. After an eternal journey of 65 days (probably transported by camels and horses along the silk road ) I recently received my Imalent 18650 cells from Gearbest. Those cells had a residual idle voltage of 3.28V when they arrived. My plan is to discharge them down to 2.5V first and then charge ‘em up to 4.20V and then discharge again to 3.8V for storage. Afterwards I want to know the cells capacities and their iR, so I can put a label onto the shrink sleeve. Would this plan make sense or do you have better recommendations? b) Do you prefer the remote app via bluetooth or the UI that needs to be programmed on the device by a lot of button presses? When I want to test battery capacity I use cycle mode C>D. Then depending on the results I’ll charge it, store it with a storage program or throw it away. You can do C>D>C also, the only down side is once the second charge routine starts it begins measuring charge mAh so you need to catch it between the discharge and the second charge. That amount of time is determined by what you have D. rest set to. The discharge mAh results are redisplayed only after the second charge cycle is done. IR is displayed by clicking up and down at the same time with the slots in ready mode. I'm new to this too, but the cheat sheet on the bottom of the first page says how to test IR if that helps any. D-Reduce will lower the charge current when battery voltage (during discharge test) gets close to V cutoff. Per the manual, this can be used to test capacity of alkaline batteries, and factors in an alkaline's ability to recover. Through experimenting, I found that setting D-Reduce to about 50% (of set discharge current) can get you close to an alkaline's rated spec. For example, a while back I did a discharge test on an Energizer C-cell. Discharge current was set to 100ma (duplicating Energizer's testing spec), and D-Reduce to 50%. From Energizer's rated capacity HERE, I got pretty close (6416mah), but not without using D-Reduce. Thanks Frank, very helpful. Right now I am using Simple Mode, so knowing storage default is 3.8V, I’m good to go. Have not moved up to the advance modes yet where they have all the extra info in the menu. D-reduce, does that mean charging current will constantly reduce power as it gets closer to the batteries cut volt? Shouldn’t make any difference if I am putting the batteries away for awhile hopefully. What is the “termination” set to? If it’s zero or –zero move it up a little to .01V or 02V. Unless the battery is in very good condition it may never settle in at exactly 3.8V. I have two storage programs saved one at 3500 cap with .05V term and the other at 900 cap with .02V term and I get the green light. Set termination voltage to 0.01V and it worked, all green lights finally came on but had to rotate two batteries before the green light lit up so maybe I need to set termination to 0.02V and see if that works better, thanks for the help! I think it's much better to go right to the advanced menu and sort it all out from the beginning. Thank you Frank! Just out of curiousity, is there any difference between the capacity values of a discharge process and a charge process? Let’s just say I put those brand new cells I received with 3.28V into the MC3000. Will I already get the capacity and iR values if I chose to use cycle mode C>D or do I have to run a full C>D>C cycle? At what cut off voltage do you set your MC3000 when discharging cells? According to their data sheets most cells can be discharged to 2.50V or 2.75V, the VTC6 even down to 2.00V. Some people discharge their cells to 3.00V only, so I’m wondering what you guys deem to be reasonable. Discharge capacity is universally regarded as a more accurate test then charge capacity mainly because of the heat loss during a charge, heat is energy. Yes you will see discharge capacity after a cycle C>D, scroll through SOV and you will see IR and more. Following manufactures data sheets IMHO is a very good safe practice. Nice infos above, about the storage modes suggestions. Just sharing what I usually do for capacity testing — (I only use the Advance mode of the MC3000, since that’s where we could get all options) I use the default Refresh cycle of C>D>C. But usually, I charge the battery first to 4.20v independently (maybe using a lower ending current than the normal “Charge” ending current of 1/10th selected Charge current), that way the battery is closer to really full (or so I think) — lower resistance cells will be quite quick, but high-resistance cells may take a longer time. So, let’s say I charge an 18650 to 4.20v, but I manually select ending current of 0.03A (normally when one selects 1A charge current, ending current is 1/10th or 0.10A; select 2A charge current, the ending current is 0.20A, which is quite high and may not fully fill up the the battery). Manually selecting the ending current seems to ensure the battery stays at 4.20v even when removing the battery from the charger. (I think doing this is a bit more “stressful” to the battery though. But I do this (lower ending current) only when I want to do capacity testing). But during the C>D>C Refresh, I usually don’t try to change the ending current anymore (so it stays at the default 1/10th). Usually I test 18650s at 0.50A discharge current (this may be lower than 0.2C for higher-capacity cells, but at least I’m testing the cells in a more “standard across different cells” or comparable way for the various 18650s; rather than testing strictly according to the manufacturer specs). Thanks for the tip Now that I have Storage mode working perfectly, I'm going to try my first Charge mode in the Advanced menu and see if I can figure it all out. I kind of like charging my batteries to 4.1V instead of 4.2V so it's going to be nice to finally be able to do so for my batteries in series to the voltage I actually want. Nice infos above, about the storage modes suggestions. Just sharing what I usually do for capacity testing -- (I only use the Advance mode of the MC3000, since that's where we could get all options) I use the default Refresh cycle of C>D>C. But usually, I charge the battery first to 4.20v independently (maybe using a lower ending current than the normal "Charge" ending current of 1/10th selected Charge current), that way the battery is closer to really full (or so I think) -- lower resistance cells will be quite quick, but high-resistance cells may take a longer time. So, let's say I charge an 18650 to 4.20v, but I manually select ending current of 0.03A (normally when one selects 1A charge current, ending current is 1/10th or 0.10A; select 2A charge current, the ending current is 0.20A, which is quite high and may not fully fill up the the battery). Manually selecting the ending current seems to ensure the battery stays at 4.20v even when removing the battery from the charger. (I think doing this is a bit more "stressful" to the battery though. But I do this (lower ending current) only when I want to do capacity testing). But during the C>D>C Refresh, I usually don't try to change the ending current anymore (so it stays at the default 1/10th). Usually I test 18650s at 0.50A discharge current (this may be lower than 0.2C for higher-capacity cells, but at least I'm testing the cells in a more "standard across different cells" or comparable way for the various 18650s; rather than testing strictly according to the manufacturer specs). Good info too thanks. I use to charge all my batteries to 4.2V, but as of late, feel more comfortable at 4.1V. Anyone know why the MC3000 needs the battery capacity entered? I was just thinking that if I entered for example 5200mAh for my 26650 keeppowers, what would the charger do with that info. Unless a C>D>C was done, it wouldn't know where the cut capacity would be for it anyway, would it? Someone on the "other" forum suggested changing "Capacity" in the menu to "Cut Capacity", but how would that help unless a full CDC cycle was performed. Maybe I'm over thinking, but it would be interesting to find out. Anyone know why the MC3000 needs the battery capacity entered? I was just thinking that if I entered for example 5200mAh for my 26650 keeppowers, what would the charger do with that info. Unless a C>D>C was done, it wouldn’t know where the cut capacity would be for it anyway, would it? Someone on the “other” forum suggested changing “Capacity” in the menu to “Cut Capacity”, but how would that help unless a full CDC cycle was performed. Maybe I’m over thinking, but it would be interesting to find out. It’s just a safety option to ensure the cell will not be overcharged or if you deliberately intend to restrict the amount of energy charged into a cell. According to the (German) manual a 20% surcharge to the expected/nominal capacity is a reasonable value to work with. I assume this option can also be set to “OFF” if not needed. Thanks a lot for sharing your experience! I still have to figure out what values for TERMINATION and D.REDUCE (which seems to be the counterpart of TERMINATION in the discharge process) are the most appropriate in order to measure the cell’s capacity. I.a.w. the manual I just learned that very low values will ensure that the maximum amount of energy is being charged into the cell at 4.20V cut off voltage (=TERMINATION) and the maximum amount of energy is being discharged from the cell at 2.50V cut off voltage (=D.REDUCE). Using higher values will let the idle voltage rise faster on discharged cells respectively will let the idle voltage drop faster on fully charged cells. The down side on using low values is a much longer charge/discharge process and the battery’s lifetime may be reduced due to more stress. It's just a safety option to ensure the cell will not be overcharged or if you deliberately intend to restrict the amount of energy charged into a cell. According to the (German) manual a 20% surcharge to the expected/nominal capacity is a reasonable value to work with. I assume this option can also be set to "OFF" if not needed. Makes sense, thanks. Have to look and see if the 20% surcharge can really be set to off or not in my manual. I went to the MC3000 website and asked them if the rated battery capacity is the number I should enter where the menu askes for capacity and they said "You should set it according to your battery type and charger charging current range. Generally lower than the battery capacity"
So I then asked them if there is some type of calculation I can use to figure that out as their manual says as an example to enter 20% more or 4200mAh for a 3500mAh battery under the capacity info. Opposite of what they just told me. Confusing. I just turned the capacity limit to off (I wonder if that’s safe) since I used to keep on getting “capacity cut” message (and the heretofore recorded data is inaccessible when that happens) — happens on NiMh, or on old high-resistance Li-ion batteries, where the input (charged) capacity will be much higher than the discharged capacity. So now I just turn it off. I just use the high-temperature limit to prevent batteries from overheating though (some of the old laptop-pulled batteries will overheat, and charging refuse to go higher at around 4.05v — so when this happens, it stops the operation once the old batteries overheat) I set the temperature limit to 45 deg C, not sure if this is OK or too low though. So far, on good batteries, it doesn’t seem to reach that temperature threshold though under normal operation. If a charge is terminating on capacity, turning off capacity is not a good idea. That 4.05V stall you are seeing is an indication of a bad battery. I have seen that symptom many times with old laptop pulls, the battery is done throw it away. Can you give me some info about the NiMh batteries that are terminating on capacity, size, brand or anything else? That would help determine why it’s terminating on capacity. I noticed in the setup menu you can change the backlight to Always On, which I did. I like it that way better. I just turned the capacity limit to off (I wonder if that's safe) since I used to keep on getting "capacity cut" message (and the heretofore recorded data is inaccessible when that happens) -- happens on NiMh, or on old high-resistance Li-ion batteries, where the input (charged) capacity will be much higher than the discharged capacity. So now I just turn it off. I just use the high-temperature limit to prevent batteries from overheating though (some of the old laptop-pulled batteries will overheat, and charging refuse to go higher at around 4.05v -- so when this happens, it stops the operation once the old batteries overheat) I set the temperature limit to 45 deg C, not sure if this is OK or too low though. So far, on good batteries, it doesn't seem to reach that temperature threshold though under normal operation. I got in contact with a guy named Damien from the MC3000 website. Sent him an email and he said he will give me the info about capacity soon and how that works. His first reply on the chat was capacity is normally set to lower that what the battery is rated at. If we take the Protected NCR18650B from Panasonic, it is rated at 3400mAh, but "typical" capacity is rated at 3350mAh, so I'm guessing maybe that is what he is talking about. For anyone Interested in how the options look in the advanced menu of the SkyRC MC3000 charger for making a program, I copied the settings I have stored in my text file for storage mode, but these options also display in Charge mode etc with some set to off for obvious reasons. Once you actually see all the settings, it seems way simpler. I just entered some basic info in the program and will start to read up on each option for tweaking. I initially chose 5100mAh for Capacity of the Keeppower 26650 even though it is rated at 5200mAh as the people at SkyRC said Capacity entered normally is lower than rated capacity but they said they will give me more info soon. Text in brown is what you can actually enter in the program. CAPACITY: 5100mAh manual says ok to add 20% value which is 6240mAh and tech says to put it under! SAVE TO:  <--- Just the program # you choose to save all these settings. I just have a couple of programs for different batteries stored for storage, discharge, charge etc saved in a text file and after that, you just need to choose whatever program you have and hit the start button. BTW, the PC link software shows capacity as the "charged" value and the SkyRC LCD alternately shows both charge & discharge capacity. With NiMH, there can be a bit of difference. Threw me at first, and I illustrated this in a CPF thread HERE. Thanks for the links! Time for me to start reading again. Got the info back from SkyRC regarding how to set Capacity and below is what they said. When the setting value is less than the battery capacity, charging will end prematurely, causing the battery to be not fully charged. The final decision is whether the charging will stop or continue for the charger's own intelligent charging control circuit. It is generally recommended to set a value equal to or greater than the battery capacity. Thanks for doublechecking klrman! So, SkyRC‘s response is in line with the instructions in the manual, i.e. 20% surcharge to the cell‘s nominal capacity is a good way to get some extra safety but setting the value lower or equal might result in a not fully charged cell. However, if I summarize the common user‘s experience on the TLF (German flashlight forum) and over here, this setting can be turned OFF for lithium ion cells for there are enough safety means in the MC3000 to prevent overcharging. For NiMH cells this CAPACITY option might make more sense as those cells sometimes have difficulties with their termination current, especially when charging at low currents.